We had a great weekend with photo booths in the North and South of Devon. Portmore Golf Club in Barnstaple was the venue for a great 50th. The guests loved using the green screen photo booth and all had loads of photos to take away to remember the night. 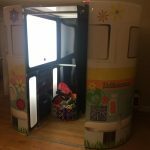 Our camper photo booth looked amazing at the Barnstaple venue.